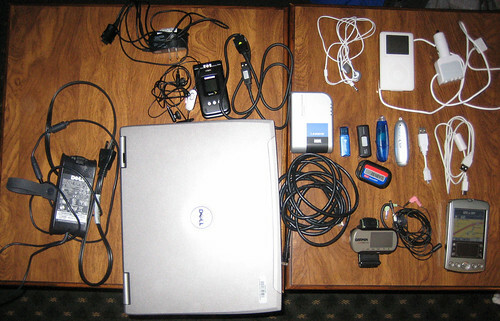 Here’s a look at the contents of my laptop bag on my recent trip to Colorado. Click through to flickr to identify each item. Missing from the picture: the camera used to take it, camera charger and the vehicle mount for the GPS. If I’m not renting a car, I leave the GPS, iPod and their accessories at home. This entry was posted in consumer electronics, gps, wireless. Bookmark the permalink. Would an iGo (www.igo.com) help? I also have a Targus AC/car/airline power brick that I use to work on transatlantic flights. It won’t charge my Dell, so I use the original power brick for domestic flights. What *would* help is if I could charge everything off USB. My camera, iPod and GPS don’t support that. How you tried consolidating? The smartphone (ultimate in converged devices) can easily replace your phone, iPod, GPS, and possibly laptop. The latest WM5 ones are quite capable. I don’t see getting by without a laptop despite the mobile phone hype. The iPhone is the closest, but at least from what’s announced so far, no GPS in the first release. That’s a huge omission for me. I’ve had a smartphone in the past but got tired of the bulk for day-to-day use. My A900 is the ideal size for carrying around. I’m seeing a lot of innovation in the portable navigation device space. Many of the newer GPS units bundle in music playing, Bluetooth handsfree support and even picture viewing.